Often overshadowed by the Hunter Valley, Mudgee is its own, unique destination, with restaurants, wineries and scenery that can easily rival any other wine region in Australia. Mudgee actually means “nest in the hills” according to local Wiradjuri Aboriginal tradition, and we think that’s a pretty accurate description of this stunning region, just a few hours north west of Sydney. If you’re looking for a wine weekend with friends, or to simply get away from the craziness that is Sydney living, Mudgee should be on your radar. To help you with your planning (so there’s more time for wine drinking), here’s where to eat, drink, stay and play when in Mudgee. These brand new apartments are essentially a home away from home. Super clean with plenty of space, these apartments come with free wifi, coffee machine, a big bath (perfect for post winery soaking) and even a private outdoor area for al fresco hangs. It’s only a five to ten minute walk into the town centre, which means no designated driver needed! Should you need somewhere to park your airplane, Hangar House Mudgee is your place. Okay, so not all of us have an airplane (what are we doing with our lives?!) but you don’t need a plane to stay in these luxurious apartments located, you guessed it, right at the airport. Don’t worry though, there’s not much air traffic at Mudgee airport so noise won’t be an issue! Back in 1862, this grand old building was once a Mechanics Institute, now it is one of Mudgee’s most stylish places to stay. This boutique self-contained apartment hotel offers an “eat to your heart’s content” minibar (hold us back! ), free wifi and ridiculously comfortable king size beds. Located right in town, it’s the perfect spot for Mudgee weekending. 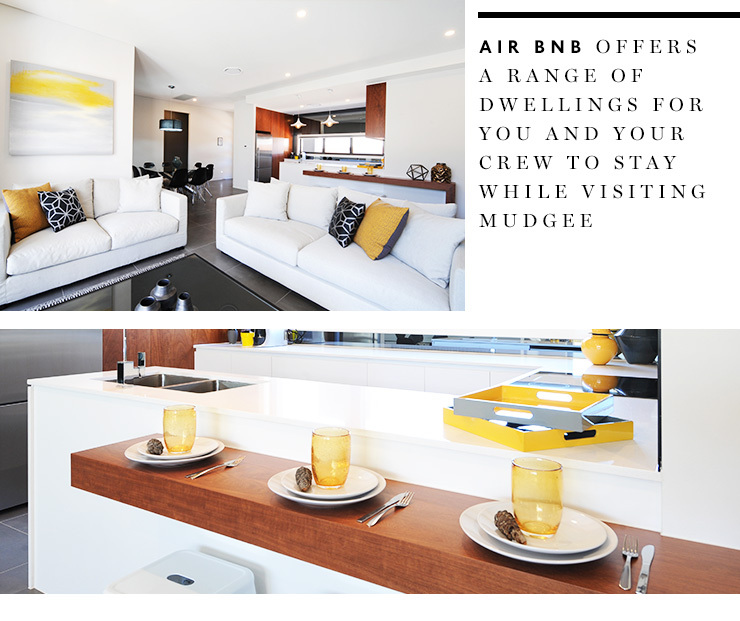 For a unique stay, Airbnb offers a range of dwellings for you and your crew to stay while visiting Mudgee. Head to the website to see what’s on offer. The first winery you’ll see on your way from Sydney, Logan Wines is a sight to behold. The tasting room is a beautiful piece of architecture (serious house goals here) and the wine is top notch. Using grapes from the Mudgee region as well as Orange, it’s a great spot to visit when arriving or leaving Mudgee. Be sure to keep an eye out on their website for upcoming wine dinners—they’re pretty special. One of our favourite wineries of all time, Lowe Wines is all about organic and biodynamic wines. Owner, David Lowe, is a man passionate about his wines, and it shows in the product he produces. The flagship zinfandel is known around the world (for good reason) however you won’t go wrong with whichever wine(s) you end up taking home—just ask one of the friendly and knowledgeable staff for some advice. A final few pieces of advice: give a pat to Louis, the resident wine dog and make sure you order some food while you’re wine tasting—it’s incredible. This family owned boutique winery in Mudgee is small, personal and very friendly. Oh, and with great wines too. The views over the vineyards and onto the fields are stunning and the optional cheeseboard is pretty fantastic too. Do a wine tasting, or order a glass to take out onto the deck to enjoy with said cheeseboard. Whatever you choose to do, it’s going to be a good time. 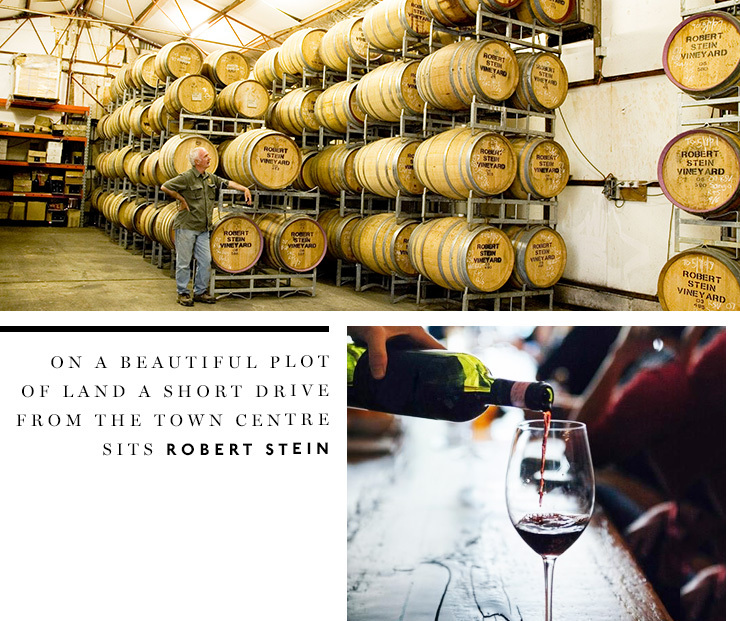 On a beautiful plot of land a short drive from the town centre sits Robert Stein Wines. With an intimate tasting room and an excellent array of wines to sample, this should be a stop on your winery tour checklist. There’s even a vintage motorcycle museum on site for some post tasting wandering, and well-known Pipeclay Pumphouse for a delicious lunch. Roth’s Wine Bar looks small and unassuming from the front but when you walk through the shopfront, you’ll quickly see this spot is a lot larger than it appears, and is popular among locals for eats, drinks (especially the wines) and live music. Reserve a table on weekends as this place can get busy, and tuck into their bar snacks. Mudgee isn’t just about wine. In fact, sometimes after a day full of wine tasting, all you may want is a nice cold beer. Mudgee Brewing Co has that and then some. Try the Mudgee Mud (a local fave) which is a dark imperial stout or, for something lighter, the Mudgee Pale Ale will cure what ails you. With regular live music and a killer steak on the menu, this is a great place to unwind. 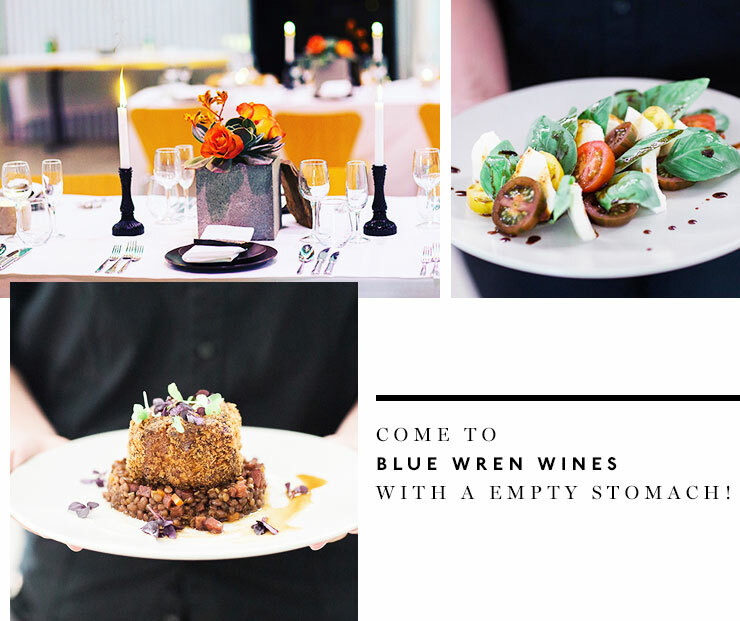 Blue Wren Wines is a Mudgee winery with an exceptional restaurant on site. If offered a choice to sit at a table or at the bar, always opt for the bar, because this offers the perfect vantage point to watch the chefs at work. Here you can expect some of the most creative dishes coming out of the region—think corn dust (which you’ll want to sprinkle on everything), duck liver ice cream and smoked rice, as just a few things you’ll see on your plate. Pro tip: Come with an open mind and hungry stomach. A super cute café located in the heart of town, Alby + Esther’s serves up classic breakfast fare using local ingredients. The house made beans will keep you sustained throughout the longest of wine tastings, and their pastries are pretty hard to resist when paying your bill. Take a seat in the courtyard on sunny mornings, or retreat to the art gallery to devour your jaffles. Using primarily homegrown produce, the guys at Pipeclay Pumphouse showcase the true flavours of the ingredients by preparing them simply, but with great care. A perfect place for lunch or dinner, the sautéed bacon gnocchi with braised beef, the pork rillette and the caramelised onion tarte tatin are always a hit. Couple your meal with a glass (or more) of the local wines on hand and you’re onto a winner. Finding good pizza in the country can be a hard task, but at di Lusso you can get tasty pizzas, great wines as well as a game of bocce in all before dessert. Their pizzas are wood-fired and are all best paired with the wines from their vineyards, which have been conveniently recommended next to every dish. Want a margherita? Enjoy that with a pinot grigio. Anchovies with capers? You’ll want to try it with a vermentino. Located right in the middle of town, Elton’s is where you head for brekkie, lunch, dinner AND drinks. Yep, they do it all. With an ever-changing menu, and a number of craft beers on tap, this little spot will fill that hole in your belly. If you’re after a biiiiig brekkie, the baked eggs are about the size of your head and will fill you up for hours. If you’re at Elton’s a bit later on, the burgers are a treat as well as the tacos. It’s a little bit of the city in Mudgee. As Mudgee’s only hatted restaurant, big things are expected from The Zin House and it doesn’t disappoint. Set in a gorgeous modern farmhouse overlooking the countryside, this is the perfect place for a long and lazy lunch. Sourcing the produce from as close as possible (even from their own garden), the food here may be simple, but it truly lets the ingredients play a starring role. Take a break between courses and wander the garden, or pat the donkeys, and start the next course. This is truly a memorable Mudgee experience. ICYMI, Mudgee has a tonne of wineries. To make the most of the tastings, and to avoid having to choose a designated driver, reserve a seat on the Mudgee Tourist Bus. These guys will pick you up from your accommodation, take you to visit a number of wineries and then get you back to town safe and sound. With options for a half day or full day tour, this group tour is a whole lot of fun. If playing nice with others isn’t your thing, they also offer private tours. Mudgee is a haven for cyclists who want to get out of the city and soak up some of that fresh country air. There are a range of routes from short rides around town to longer and more challenging trails for the more experienced, meaning whatever your level, you’ll find something that’s right for you. Get your Mudgee Cycling Guide here. Saturdays in Mudgee are all about the local markets. Pick up some honey, knick-knacks and gifts, and maybe even some snacks while you’re there. A short 50 minute flight from Sydney, Fly Pelican operates daily and with airfares from only $99 per person, it’s a pretty cost effective and time saving way to get to this part of the world. A rather pleasant drive through the Blue Mountains, the drive to Mudgee will take approximately 3.5 hours. The upside to driving is that you’ll be able to get yourself around the place when you’re there and you won’t have to worry about baggage limits from all the wine you’ll probably end up buying. Looking for somewhere else to escape to this weekend? Read our weekend guide to the Hunter Valley.